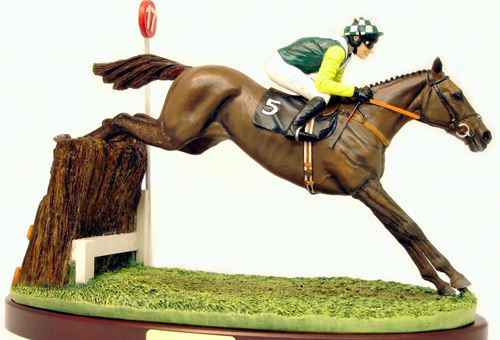 Nicknamed ‘’The Tank’’ This sculpture depicts Denman as he storms his way to a seven length victory in the 2008 Cheltenham Gold Cup. So sad that with the announcement of his retirement we will never see this fabulous horse race again. We would like to thank Champion Trainer Paul Nicholls for approving this sculpture at Cheltenham. Owned by Mrs M Findlay and Mr P Barber. Limited Edition of 500 and made to order only, please allow 4-6 weeks for delivery. Materials: The sculpture is cast in resin, hand crafted and hand painted using the finest oil paints.